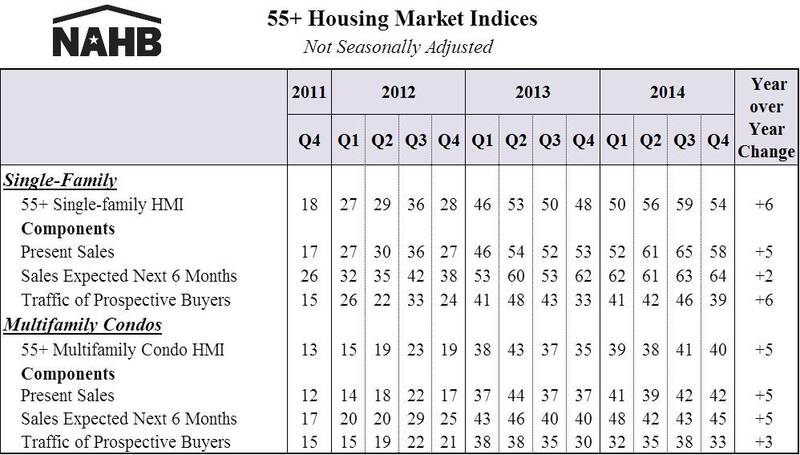 NAHB’s 55+ Housing Market Index (HMI) shows that builders continue to feel positive about the market. The sentiment indices were higher year-over-year for all segments of the 55+market—single-family homes, condominiums and multifamily rental. 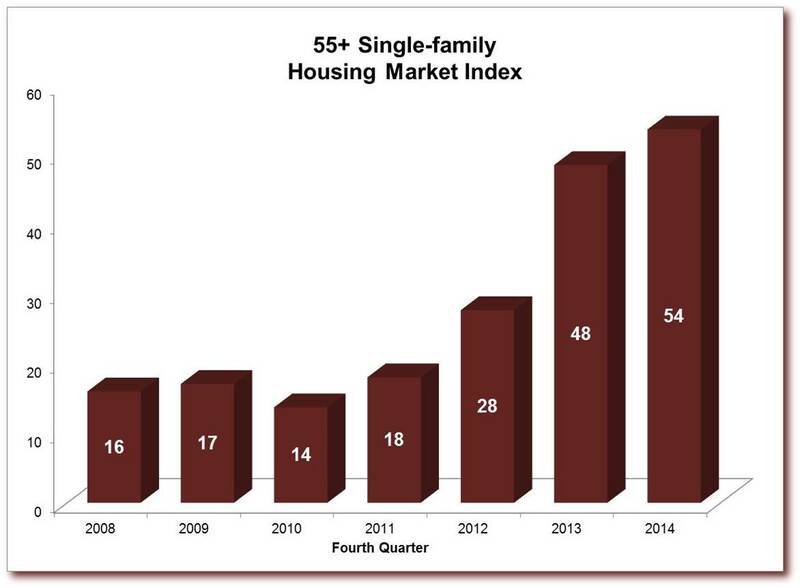 The single-family index increased six points from the fourth quarter of 2013, to 54—the highest fourth-quarter reading since the inception of the index in 2008 and the 13th consecutive quarter of year over year improvements. There are separate 55+ HMIs for single-family homes and multifamily condominiums. Each measures builder sentiment based on survey that asks if current sales, prospective buyer traffic and anticipated six-month sales for that market are good, fair or poor (high, average or low for traffic). An index number below 50 indicates that more builders view conditions as poor than good. The series are not yet long enough to be seasonally adjusted, so results need to be compared year-over-year. The strength of the 55+ segment of the housing industry has been fueled in part by rising home values; older homeowners are finding it easier to sell their existing homes at a favorable price, allowing them to rent or buy a new home in a 55+ community. For more information about NAHB’s 55+ HMI, including the complete history of each index and its components, see www.nahb.org/55HMI.